Le Cordon Bleu partners with the University of Fortaleza and Anima Educação to launch new undergraduate and postgraduate programmes in gastronomy, hospitality, wine and management. 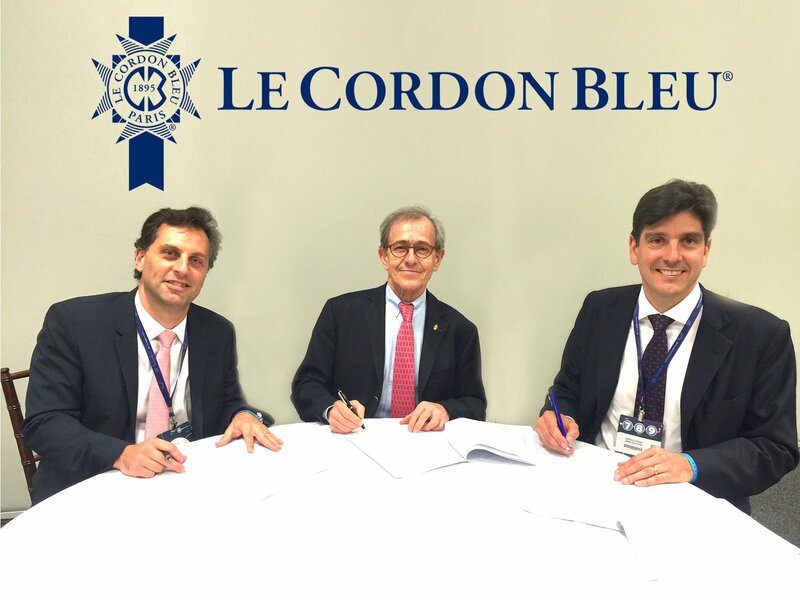 Paris, 9th November 2016 - Le Cordon Bleu, the leading Global Network of Culinary Arts and Hospitality Management Institutes, is proud to announce the future opening of new institutes in the context of two joint ventures with Anima Educação (Sao Paulo, Santos, Bello Horizonte), and with the University of Fortaleza. These partnerships focus on the development of undergraduate and postgraduate, technical and extension courses in gastronomy, hospitality, wine tourism and management. For example, the Belo Horizonte campus will deliver a range of Bachelors in Hospitality Management, Tourism Management and Gastronomy and Culinary Management, while Le Cordon Bleu Anima Instituto de Artes Culinárias de São Paulo, will be delivering a range of vocational culinary programmes. Following an official agreement signed on November 8, 2016, an announcement took place the following day during a press conference on “Executive Education” before 1000 people, at the HSM Conference center. Le Cordon Bleu Anima and Le Cordon Bleu Unifor will start operating in the States of São Paulo, Minas Gerais and Fortaleza in the second quarter 2017. Daniel F. Castanho, President of Anima Education Group, underlined his pride bringing to Brazil “a new level of expertise focusing on Tradition and Excellence in Quality and Innovation”, and thanked Le Cordon Bleu for its partnership in this exciting venture. Le Cordon Bleu will also inaugurate its flagship school in Rio de Janeiro in 2017, in partnership with the local government. Both parties are working hand in hand to make this opening happen shortly. According to André Cointreau, President Le Cordon Bleu International: “It is within Le Cordon Bleu’s core values to turn passion into expertise, enabling students to take the initial steps towards a lifelong successful and international career. In Rio, the future institute will also have a special mission, being at the service of the local cuisine and the communities”.